Wolves may be the most maligned wild animals in North America. Driven toward extinction, then reintroduced to critical areas, now hunted from airplanes and helicopters - it is an abusive relationship to say the least, and we are the unpredictable abuser. Idaho officials are now blaming this historic scapegoat for declining elk populations (even though the Clearwater National Forest -- an area targeted by Wildlife Services' aerial gunning plan -- was experiencing steep declines in elk numbers as early as 1988, well before wolves returned to the area). But as Americans, we always have to have someone to blame and kill. The elk decline couldn't possibly be related to any human-caused element like over-development of wild areas or the pollution of fragile ecosystems upon which the elk rely, could it? Blamed for everything from evil powers to over-predation, wolves are favorite scapegoat of game hunters, farmers, and now the Wildlife Services. The term "Hour of the Wolf", used famously by filmmaker Ingmar Bergman, describes the hour between night and dawn when all terrible and evil things happen. While the history of wolves killing people is minimal - especially in North America, the superstitions and fears surrounding wolves are often exploited as a justification for their systematic killing - including aerial hunting, which Sarah Palin made so famous. Wolves have certainly made life difficult for animal farmers with bad fences, but one of the main arguments for bringing wolves back from the brink of extinction (to naturally control populations of game) has become a sick joke. According to Defenders of Wildlife, "Idaho officials last week called in Wildlife Services -- the federal government's chief wildlife-killing agency -- to kill wolves in the central part of the state. Federal marksmen took to the skies in Idaho's Lolo wilderness, targeting up to 60 wolves to help artificially boost game populations in the region." 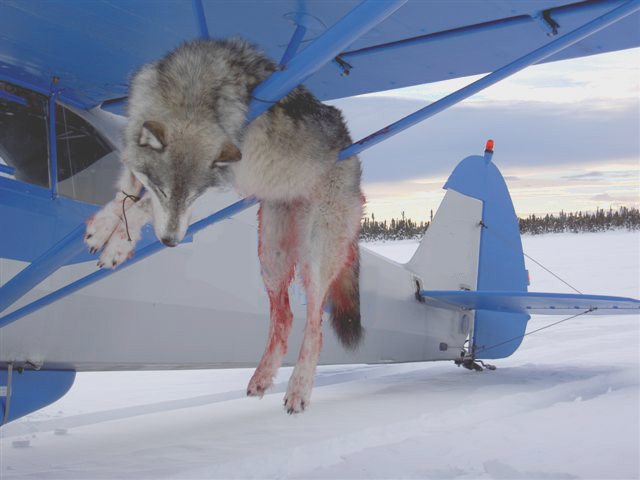 Please click here to take action an send a strong message to Wildlife Services, that the aerial gunning of wolves is not the best solution. Using proven, effective non-lethal methods of control is optimal.